South Koreans erupted in applause as Donald Trump and Kim Jong-un met for what local media billed as the "talks of the century". As the historic first meeting between a sitting US president and North Korean leader began in Singapore, images of Mr Trump and Mr Kim exchanging handshakes and warm words drew jubilant reactions in Seoul and hopes for a new beginning with Pyongyang. Mr Moon, whose earlier meetings with Mr Kim had paved the way for the Singapore summit, smiled and applauded alongside his cabinet ministers as they watched live-streamed scenes from the summit at the presidential Blue House. He has spent "a sleepless night" with excitement ahead of the meeting, his office said. "The two leaders are certainly under great pressure to make the talks of the century a success," the editorial said. "We hope today's summit will make a breakthrough to open a new era of peace and prosperity." 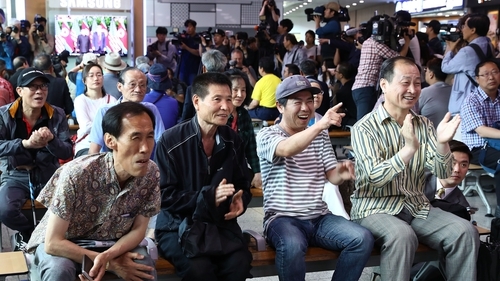 Elsewhere scores of people were glued to TV screens at the Seoul railway station, cheering and clapping in response to Mr Trump and Mr Kim's cordial greetings. "Looking at the two leaders shaking hands, I thought... 'I am living in a historical moment'," she told AFP. "A great shift in world history is in the making," one Internet user said in a comment response to a news story. But others were sceptical of Pyongyang's intentions, citing earlier attempts to improve relations that later foundered. "Kim Jong Un's agreement to meet Trump means he's having a hard time (from sanctions). But we're giving him a chance to survive again after we did so with Kim Jong-il," wrote another, referring to previous peace overtures to the North Korean leader's father.